In this signature series celebrated Disney artist Trevor Carlton takes us on a journey as we remember the time we "fell in love" with Disney. 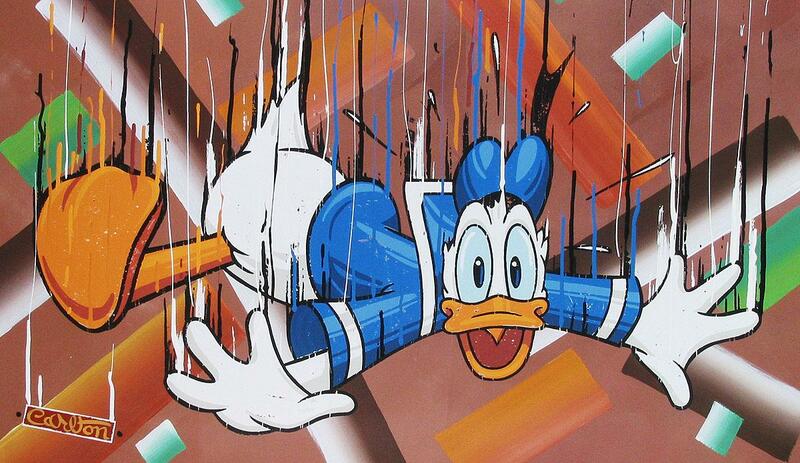 Few artists have portrayed those moments with the humorous and literal flair that Carlton has infused in this series entitled "Falling For Disney". In the traditions of hand-made artwork, Carlton's "Fallin Donald" marries the process of traditional print making and the spontaneity of original art with beautiful synchronicity. Each piece in the series begins with a hand painted original background, Carlton then adds the Donald he created to the canvas through traditional print-making techniques and completes the process by infusing hand painted accents into this multi-faceted, richly textured work of art. This unique collection of mixed-media originals pays artistic homage to the moment we all "fell" for Disney.